Last year I was asked by George’s wife, the poet Rachel Hadas, to participate in a memorial tribute for him. This took place on September 28, 2012 at Columbia University’s Italian Academy for Advanced Studies in America. It was a lovely and often moving gathering, with Rachel, Jonathan (George and Rachel’s son), and many of George’s friends, colleagues and former students in attendance, and I was honored to have been invited, along with several distinguished speakers, including — among others — Columbia University musicologist Elaine Sisman and composers David Rakowski and Fred Lerdahl, to offer my reminiscences. George’s tribute was a wonderful example of how such events can serve as occasions to celebrate and reflect upon the character and accomplishments of the person whose memory is being honored, while simultaneously avoiding the maudlin or morbid. To be sure, no attempt was made to sugarcoat the sad fact of George’s death from complications of Alzheimer’s Disease, which had been diagnosed in him at the age of sixty-one and from which he had suffered for a number of years. In fact, one of his physicians, Dr. James Noble, a Professor of Neurology at Columbia, also spoke at the memorial, sharing his recollections of meeting and working with George; he seemed particularly glad to make the acquaintance of and hear from those who had known George before the onset of his illness. For all this, though, there was not so much as a hint of sentimentality in any of the proceedings, something I’m certain the George we all knew would have been relieved to know. He was justly remembered as the brilliant composer, musical analyst, essayist and teacher he was, and as a generous colleague. He was praised as well for his steady, fair and even-handed leadership during his tenure as Chair of the Department of Music at Columbia. There also were stellar performances of George’s music: pianist Stephen Gosling gave a powerful account of the darkly brooding Suave Mari Magno (1984), and conductor Jeffrey Milarsky and a crackerjack ensemble consisting of flutist Tara O’Connor, clarinetist Alan Kay, violinist Aaron Boyd, cellist Jeremiah Campbell, percussionist Tom Kolor, and Mr. Gosling, brought to life the brilliant and pellucid textures of The Isle is Full of Noises (1995). My little speech covers some of the same ground as my earlier post, taken primarily from liner notes written for the Albany Records CD of George’s music, but there are one or two other little tidbits that are new, as well as a bit more of a personal emphasis. What made me especially happy about George’s memorial (and the reception that followed) was that there was a good amount of laughter — laughter engendered by anecdotes from several of the speakers (Elaine Sisman and Davy Rakowski particularly come to mind) that bespoke George’s quick wit and wicked sense of humor. To hear those stories was to hear George’s voice again, and for that I am and shall remain grateful. 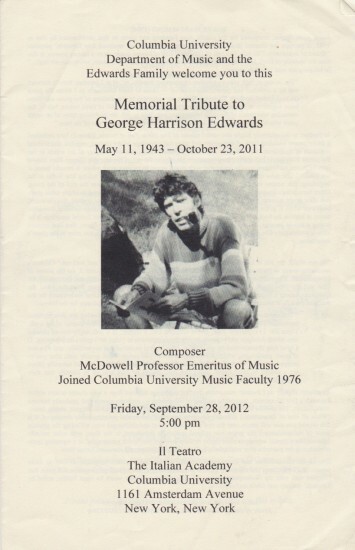 Program cover for George Edwards Memorial Tribute.